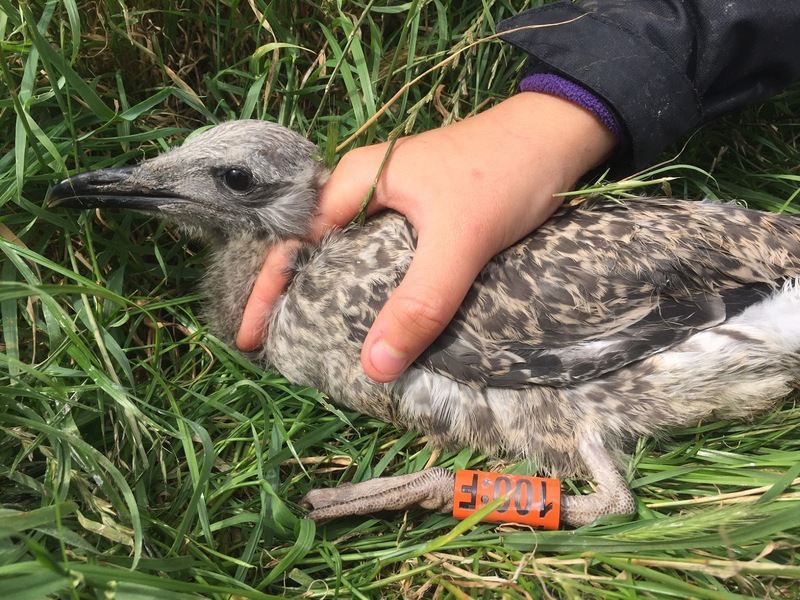 A successful trip was made to Inchcolm Island on the Forth to start a new project colour-ringing lesser blacked-backed gull chicks. The project hopes to increase knowledge of LBBGU movements; distribution of wintering grounds and breeding site fidelity of the Forth birds. The ongoing baseline effort is to colour-ring one hundred chicks each year on the island. The colour-rings are orange with 4 letter alpha-numeric codes, with three numerical digits followed by a colon and ‘F’ (for Forth) e.g. 001:F.
The colour-rings have been funded by the SOC Endowment fund and the metal rings kindly provided by Lothian Ringing Group. Special thanks to John Davies for securing project funding and organising the trip to Inchcolm. Thanks also to Liz Humphreys, Rob Campbell, Jeroen Minderman, James Leyden and Sarah Long for their efforts in getting the project up and running. The ringing team (Calum Campbell). We look forward to the sightings! Please report any sightings to johncdavies@blueyonder.co.uk.